On the heels of signing a deal with Barry Bonds to bring the star back to cards, Topps is issuing his 2004 card via an in-store promotion. On or after December 27th, fans and collectors can walk into any Topps Home Team Advantage Store and receive the Barry Bonds 2004 Topps trading card for free when purchasing a pack of the all-new 2005 Topps Baseball Cards. This issue extends his string of Topps Baseball Card appearances to 19 consecutive years. "It's important to Topps, fans and collectors that we issue this card in 2004," said Warren Friss, VP, Topps. "We want to be there every step of the way for Barry's amazing career." Fans and collectors can dial 1-888-GO-TOPPS or visit www.topps.com for a Home Team Advantage Store in their area. The offer is good while supplies last. 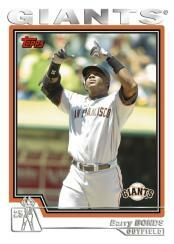 "Bonds is one of the most collectible athletes in sports," said Alan Narz, Owner of Big League Cards in Orlando, FL. "This promotion is great for hobby shops as it will generate additional store traffic during the holiday season." Topps has also been granted exclusive rights within the MLB trading card category for autographed baseball cards, game-used memorabilia cards and Bonds' image use on packaging and advertising.